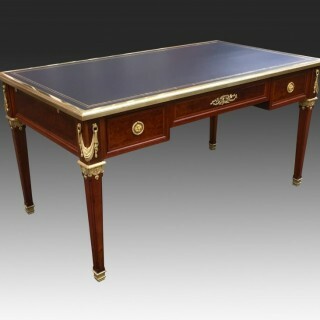 An absolutely fabulous antique Neoclassical writing table made to the very highest standards. 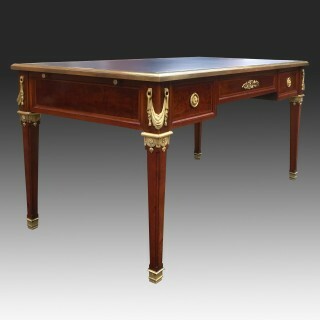 This superb desk was made from top quality ‘plum pudding’ mahogany, acajou mouchete and fitted with superbly detailed ormolu mounts to produce a stunning quality piece of furniture. 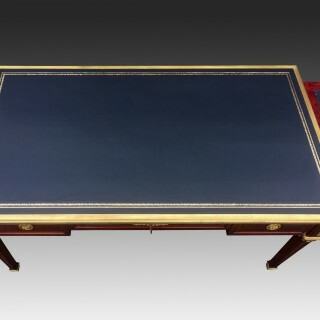 The writing table, or desk, is fitted with three oak lined drawers with hand cut dovetails, original brass locks and the original ornate key. 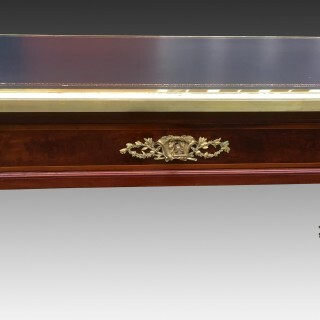 The drawers have floral, wreath style handles to the side drawers and an ornate floral escutcheon to the middle drawer. 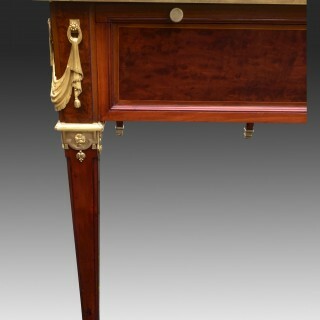 The drawer fronts are in ‘plum pudding’ mahogany with cross-and with boxwood stringing. 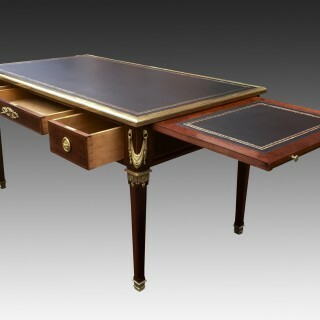 The reverse of the desk has identical faux drawers and the sides are similarly panelled. 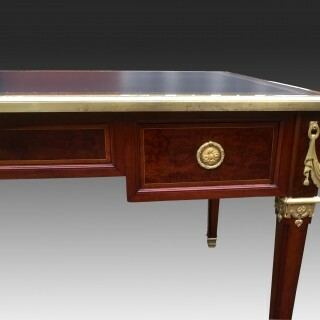 The top of the desk is fitted with a replacement black hide writing surface with gilt and blind tooling. 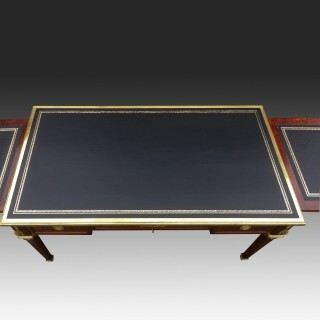 It also has writing slide extensions with a black hide surface, gilt and blind tooling and a mahogany border. 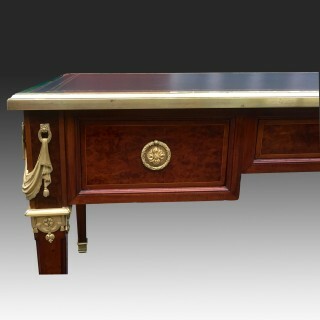 The top edge of the desk is fitted with a band of brass with a moulded edge. Each corner of the desk has a very detailed ormolu swag and beneath these is an ormolu collar with floral discs and pendants. 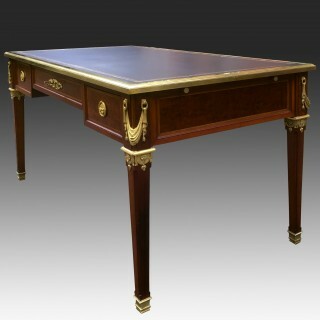 The desk stands on four square section, finely tapered legs with concave edges terminating in with ormolu architectural cup feet. 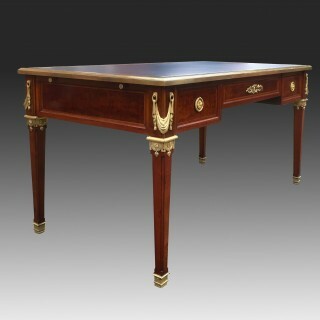 This fabulous antique French writing table or desk from the Belle Epoque is a refined and very beautiful piece of furniture. 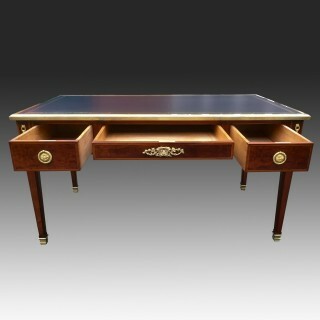 It is both practical and stunning and it would makes a superb central focal point for any classical or contemporary styled office or library. 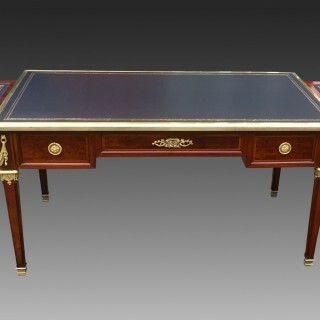 The desk has recently been professionally restored including wax and French polishing. Superb condition. Has been professionally cleaned and French polish and a new writing leather fitted.